"What will separate us ...?" For the 5th consecutive Sunday, the 2nd reading today is taken from the 8th chapter of St. Paul’s letter to the Romans [Romans 8:35, 37-39]. Today’s text is a rhetorical flourish, which concludes both this chapter and the whole 1st half of St. Paul’s letter. What will separate us, St. Paul dramatically asks, from God’s love for us as revealed in Christ Jesus our Lord? His answer: nothing will! Not that there isn’t plenty out there to get in the way of our experience of God’s love! Not for Paul the complacent, self-satisfied posturing that pretends that there are no obstacles and that everything is automatic! Paul knows only too well what obstacles there are and how powerful they seem to be. He even enumerates a bunch of them: anguish, distress, persecution, famine, nakedness, peril, the sword. Paul’s point is not that these things are no longer real or that they don’t threaten us, but that God’s power is greater than the forces that oppose it – and so can overcome all obstacles that threaten to separate us from God and the salvation his love intends for us. Nor does Paul confine his concern to impersonal forces. Like most people for most of human history, he experienced his world as affected by the presence of powerful beings, demonic beings, who make this world a very dangerous place. In Paul’s time – as again in our own increasingly re-paganized society – desperate people turned to the falsehoods of astrology in order to cope with the threats from present things and future things. Paul’s conviction, which he intends should become ours as well, is that God’s power is greater – awesomely greater – than that of any being that might oppose him in order to separate us from the salvation God’s love intends for us. I know I’ve told this story before, but one of the 1st phone calls I had in my 1st assignment after seminary was from a someone who was anxious because the Devil was throwing books at her. Nothing had particularly prepared me to respond to this particular problem. So what I did was to try to assure her that God really is more powerful than the Devil, and that in Jesus God really has defeated the Devil once and for all. That may or may not have been what she wanted to hear. If, however, we really believe in God’s omnipotence and in his love for us as revealed in Jesus, then we will react differently to the many stresses and challenges we might otherwise be beaten down by. The point is that we have to believe in both God’s omnipotence and his love. A God who was not all-powerful would be of at most limited value for us in this threatening and dangerous world. An all-powerful God who didn’t also love us, however, would only add to the danger. That was precisely the problematic premise of the pagan religions the Gospel was liberating so many Paul’s contemporaries from. No wonder scared, terrified pagans consulted astrologers! Can you blame them? If God had not revealed himself – and his love for us – as he has done in his Son Jesus, we too would be equally desperate, clutching at any superstitious practice that promised to placate perhaps and maybe manipulate such dangerous powers. God, however, has revealed his love for us – not as an abstraction, but as a person, Jesus, whose heart is moved with pity for us and satisfies us with food we could never buy on our own. There will always be an insurmountable gap between our meager human resources – our 5 little loaves and 2 fish [Matthew 14:13-21] – and what God can accomplish on our behalf. Once we are willing to put ourselves at his disposal, however, God’s great love for us, present and active among us in Jesus, will transform us by his blessing and enable us to accomplish, on his behalf, what we could never ever have imagined doing on our own – to conquer overwhelmingly through him who loved us. And so the same Christ who feeds us whenever we assemble in his presence also commands us – as his disciples, as his Church – to join him wholeheartedly in feeding the world with the bread of joy that comes from recognizing and sharing his presence in our world. Homily for the 18th Sunday in Ordinary Time, Immaculate conception Church, Knoxville, TN, July 31, 2011. Congressmen are sometimes categorized as either “workhorses” or “show horses.” When I was in seminary, we used a somewhat similar dichotomy to categorize one another. Based on Luke 10:38-42, one was either a “Martha” (burdened with much serving) or a “Mary” (who sat beside the Lord at his feet listening to him speak). Such stereotyping obviously was surely unjust – perhaps even to those who were being so characterized, but certainly to the two holy women in the Gospel. On this feast of St. Martha, it seems only right to recognize Martha’s many merits. After all, Jesus and his disciples presumably expected to be fed when they visited Martha’s and Mary’s home! Perhaps it has always been the lot of a housewife that her housework – absolutely essential for the efficient running of the home and for hospitality to one’s guests – gets taken for granted. I am sure Martha was neither the first nor the last homemaker to feel somewhat underappreciated – or to ask for help! The Gospel of John’s account of Jesus’ dining at the home of Martha, Mary, and Lazarus in Bethany omits any hint of complaint on Martha’s part, but is in other respects completely coherent with Luke’s picture. What are the two sisters and their brother depicted as doing? True to type, Martha served, while Lazarus was one of those reclining at table with Jesus, while Mary anointed the feet of Jesus with costly perfumed oil (John 12:2-3). I think Jesus valued Martha’s service to him and his disciples. He valued her hospitality (and the home her care maintained for his friends Lazarus and Mary). Jesus’ retort to Martha, as recorded by Luke, sounds to me less like a reproof than some sympathetic advice: Martha, Martha, you are anxious and worried about many things. Jesus appreciated Martha’s work ethic, but he warned her not to let it get out of hand, not to focus so much on her hospitality, for example, as to miss the focus on her guest. In ministry, that is always a ever present problem. Pope St. Gregory the Great (540-604) famously lamented in his Homily on Ezekiel: “Since I assumed the burden of pastoral care, my mind can no longer be collected; it is concerned with so many matters … With my mind divided and torn to pieces by so many problems, how can I meditate or preach wholeheartedly without neglecting the ministry of proclaiming the Gospel?” As a pastor myself- with admittedly only the tiniest fraction of Gregory’s responsibilities – I can certainly identify with Gregory’s dilemma. In all the paperwork and meetings about material things, one could, if one were not careful, lose one’s focus on the point of it all. Even worse, one can revel in one's worldly responsibilities as a kind of escape from nurturing one's spiritual life. But, then again, Jesus and his disciples assuredly expected to get fed and housed suitably in Martha’s home. Clearly no one can effectively focus on the better part (as Jesus praised Martha’s sister, Mary, for doing) while long neglecting the material needs of Christ’s body, the Church. It may be a perennial challenge to figure out how to neogitate the apparent tension between one's spiritual life and the demands of a pastoral vocation and the even more challenging tension between a spiritual/pastoral vocation and the day-to-day demands of administration. The challenge is not met, however, by devaluing or ignoring any of those components. On this date in 1868, the famous 14th Amendment to the U.S. constitution was ratified by the required ¾ of the states. Its purpose was to undo the damage done by the Supreme Court’s infamous Dred Scott decision (Dredd Scott v. Sanford, 1857) – the 19th-century political equivalent of Roe v. Wade – that held that persons of African descent were not U.S. citizens and were not protected by the Constitution. In 1866, the post-Civil War Reconstruction Congress corrected that monstrous policy of the Judicial Branch with a constitutional amendment whose expansive first section leaves no doubt about the basis for and inviolability of American citizenship: All persons born or naturalized in the United States, and subject to the jurisdiction thereof, are citizens of the United States and of the State wherein they reside. No State shall make or enforce any law which shall abridge the privileges or immunities of citizens of the United States; nor shall any State deprive any person of life, liberty, or property, without due process of law; nor deny to any person within its jurisdiction the equal protection of the laws. As an enactment of a victorious Union, having successfully defeated a rebellious secessionist movement, the 14th Amendment rightly reflected federal supremacy and the need to establish forever in the Constitution a clear basis for the exercise of federal power on behalf of the rights of citizens. In the century-plus since its adoption, the 14th Amendment (particularly its due process and equal protection clauses) has been construed in some potentially problematic ways – for example, in the legal fiction that corporations are “persons” and in the peculiar practice of “selective incorporation,” by which certain provisions of the Bill of Rights (initially intended to limit only federal power, not state power) have been imposed on the states, thus creating, for example, a host of church-state controversies, which probably should never have arisen in the first place. Of course, as with all political acts, judicial decisions may be substantively good or bad – depending on one’s particular point of view. Now, the 14th Amendment is being cited by some (among them former President Bill Clinton and Iowa Senator Tom Harkin) as providing the President a way out of the debt-ceiling impasse. This time, it’s the amendment’s Section 4 that is being invoked: The validity of the public debt of the United States, authorized by law, including debts incurred for payment of pensions and bounties for services in suppressing insurrection or rebellion, shall not be questioned. In its original context, that provision was meant to ensure the payment of Union debts after the Civil War and (in the sentence the follows the one I just quoted) to disavow Confederate ones. As written, however, it seems legitimately to suggest a more universal interpretation. Moreover, the Supreme Court has held (Perry v. United States, 1935) that this does not apply just to public debt incurred in connection with the Civil War. Now, the little constitutional law I learned years ago hardly qualifies me to adjudicate this question. But it does seem that the moral argument that Congress cannot rightly refuse to pay bills it has already authorized the U.S. to incur (which is really what this is all about) may also take the form of a straightforward legal argument. Of course, to say that, having ordered (a rather expensive) lunch, the country cannot rightfully refuse to use its credit card to pay for it does not, ipso facto, say that the President can unilaterally raise the debt-ceiling by invoking this provision. But it is, at least, a plausible interpretation. American constitutional history is, after all, full of examples of Presidents assuming unilateral powers no one had thought they had beforehand (much as the Supreme Court also has done in presuming to review congressional legislation). Like the President’s power to commit American forces to combat without a prior congressional declaration of war, a presidential power to increase the debt-ceiling unilaterally could in time become one more presidential power we will become accustomed to – and for much the same reason, inasmuch as Congress cannot effectively conduct foreign policy and maybe cannot (any longer) effectively deal with this issue. Of course, Congress used to raise the debt-ceiling routinely. So the analogy is not perfect. But the political reality is comparable. Certainly someone would challenge the President’s action in federal court, and such a prospect would hardly safeguard the markets’ confidence in the security of our public debt. Even so, I could easily imagine Congress breathing a (private) sigh of relief at not having to vote on this anymore! The President’s present public posture seems reluctant to embrace this option – no doubt for very good reasons over and above the President’s much noted tendency to be excessively cautious in such matters. Still it merits consideration – and having it on the table might just motivate a reluctant Congress to save some shreds of its dignity and actually do its job. The current fiscal crisis and accompanying political impasse have highlighted the imbalance in our society whihc essentially transfers wealth from younger workers to older retirees and benefits seniors (and Baby Boomer soon-to-be-seniors) at the expense of future generations, whose educational and career opoportunities are being curtailed and who are being saddled with such significant public debt. That's perhaps to be expected in a democratic political system, which rewards voters (older people who demand benefits and cling ferociously to them) and ignores non-voters (the unborn, children) and those eligible to vote but less likely to do so (young adults, the poor). It's probably human nature (i.e., a consequence of original sin) that people who have acquired privileges want to hold on to them. So it's only fair that those of us at the older end of the age spectrum, who have been beneficiaries of the system that has led to this presernt mess, should be challenged to look again at what matters to us and what that says about who we have become. That said, today is the feast of Saints Joachim and Anne, parents of the Blessed Virgin Mary and hence grandparents of Jesus - a day to look at the bigger picture and celebrate and honor grandparents and other elders who have contributed - and continue to contribute - to society and the formation of future generations. Of course, when it comes to the actual Joachim and Anne, what we know about them - even their names - is derived entirely from 2nd-century apocryphal literature, such as the Protoevangelium of James. The story of the pious but childless elderly couple, Joachim and Anne, seems modeled on the story - and (in Anne's case) even the name - of the prophet Samuel's parents, Elkanah and Hannah, in the 1st Book of Samuel. According to the legend, one day when Joachim went to offer sacrifice in the temple, he was refused, on the argument that men without offspring were unworthy to be admitted. Deeply saddened, Joachim went away. Meanwhile, Hannah (Anne), having learned the cause of her husband’s absence of her husband, prayed to God to heal her sterility, promising (like her Old Testament namesake) to dedicate her child to the service of God. An angel revealed to her that her prayer had been heard. Joachim returned - their reunion celebrated in tradition as “the Embrace at the Golden Gate” (see picture). In traditional extended family arrangements, grandparents often play a prominent role in family life and in the socialization of children. I was unfortunate in that I never knew my father's parents or my maternal grandfather, but very fortunate in knowing my maternal grandmother, who lived with us in our Bronx apartment until her death in September 1967, when I was 19. She spoke no English, and so I had to learn at last a minimal smattering of Italian (Sicilian dialect). She was the living link back to the family's European past that had been left behind and would otherwise have had much less influence on our very Americanized lives. she was also extremely devout, a daily communicant and candle-lighter, who passed on to me early on a great love for the Church and its ritual. One of the ostensible hallmarks of modernity has been the decline of extended family networks - and the elevation of the narrowly defined nuclear family - father, mother, children - to normative status. But, with the corresponding post-modern decline of family life (a catastrophe symptomatic of a larger pattern of social breakdown) grandparetns have often had to step in as supplemental - and in many cases even primary - caregivers for their grandchildren. The many grandparents who have stepped up to this responsibility are performing an essential function for our society, which sadly seems to place less and less priority what is required for the formation of subsequent generations. One of the highlights of a parish pilgrimage to Spain some seven or eight years ago was our group's visit to the famous shrine of Santiago de Compostela, the supposed site of tomb the Apostle St. James the Greater (whose feast the Church celebrates today) and the traditional end of the great medieval pilgrimage route known still today as the camino. (There were in fact several different pilgrimage routes that constituted the camino, depending on one's starting-point, all of them eventually converging, of course, in Compostela in Galicia). The camino has experienced a certain resurgence in popularity in post-modern Europe, especially among the young. A New York acquaintance of mine recently told me how he will travel part of the camino next month prior to participating in World Youth Day in Madrid. Like World Youth Day, the camino can be physically demanding and is presumably best done by the young. I did, in fact,go on to attend World Youth Day in Cologne, Germany in 2005, but, needless to say, I have never attempted the camino. Our group traveled to Compostella on a tour bus, and we were pilgrims only in regard to our destination, not the journey itself. Still, it was a wonderful experience to visit that shrine and to celebrate Mass there and to associate oneself, however tangentially, with what remains a living tradition, still capable of attracting adherents. One of the more picturesque customs connected with the shrine at Compostela is the famous botafumeiro, the enormous thurible that swings through the air to the delight of all who watch it. My fondest memory of Compostela, however, is the silver statue of St. James behind the altar, which one ritually embraces as part of one's visit to the shrine. Not everyone has the physical strength or stamina to undertake the rigors of the camino, but pretty much everyone can express his or her devotion by hugging Santiago's silver statue! Santiago (St. James) is, of course, the patron saint of Spain, a country that has been quickly transitioning away from its Catholic Christian heritage. (World Youth Day will, one hopes, serve as something of a shot-in-the arm for the beleaguered Spanish Church). But St. James was also the first apostle to be martyred - the only one whose martyrdom was recorded in the New Testament (Acts 12:2). As today's Gospel account (Matthew 20:20-28) of James and John's ambition reminds us, the Church's earthly pilgrimage is not about glory and honor and rewards, but is rather a time of struggle, suffering, and danger. It is sometimes suggested that, apart from the King, there really are no Belgians anymore. Modern Belgium has always been a union of 2 regions: Flemish/Dutch-speaking Flanders and French-speaking Wallonia. Their shared Catholicism crossed the linguistic divide and united the different provinces at the time of their independence from the predominantly Protestant Netherlands in 1830. To celebrate Belgium’s National Day (July 21) last week, the King Albert II and the royal family attended the traditional Te Deum in Brussels’ St. Michael’s Cathedral. But no one seriously supposes that Catholicism continues to serve as Belgium’s social glue. In any case, from its beginning, modern Belgium’s tribal linguistic fissure has seldom been far from the surface It was heightened by World War II and the subsequent dispute over the return of Leopold III to the throne. In recent decades, linguistic/regional autonomy seems to have been taken to the farthest extreme possible, short of a formal division of the country – famously even resulting in the breakup of the historic and prestigious University of Louvain (Leuven). Since the election of 2010, linguistic separatism has practically paralyzed Belgian politics, and the country has now gone more than 400 days without a Government. Two groups, which have long lived side-by-side and have shared so much history together (including the 20th century’s two World Wars) cannot compromise and form a coalition government. The United States, of course, is vastly different from Belgium in size and in its superpower status. Yet its political class is comparably fractured and similarly unwilling to compromise. Of course, Democrats and Republicans both speak English, but they might as well speak two completely different languages. For, in spite of living side-by-side and having shared so much history together, Americans today express their values in such radically different languages that they might as well almost be foreigners to one another. This is the real problem at the heart of the debt-limit debate. Like the Flemish nationalist party, the Republicans are stubbornly committed to a reluctance to compromise. They do not have all the power; but they have enough to prevent the government from functioning effectively. Like the parties negotiating to form a Government in Belgium, the parties to the debt-limit debate do not really speak the same language. In the American case, the different languages are different values about the very meaning of social life and the very purposes of political life. One hopes that our “leaders” will somehow manage to cobble something together so that the country can at least continue to pay its bills. The modesty of that minimal aspiration speaks volumes about the sad condition of a country that doesn’t seem to know how to act like a serious country anymore – and maybe doesn’t really even want to be one. The kingdom of heaven is like a treasure buried in a field, which a person finds and hides again, and out of joy goes and sell all he has and buys the field. It may be one of the most fought over pieces of real estate in the world; but, as anyone who has ever been there can attest, much of Israel is arid desert – basically a bunch of rocks. Working such land is hard and exhausting work. So just imagine the surprise and excitement and joy of the farmer or field hand who, having turned over hundreds of rocks in his life, suddenly sees something completely unexpected, something with the potential of totally transforming his life for the better! Obviously, we are supposed to see ourselves in these parables. Like the field hand and the pearl merchant, we too have found something we neither earned nor could have expected. Like them, we have the opportunity to take advantage of the gift – buying the field or the pearl – in other words, responding fully to the opportunity, recognizing that it is an all-or-nothing decision on our part. In life one either takes advantage of an opportunity, or one misses the opportunity. But we can also imagine these parables from God’s point of view. Like the farmer, God has been tilling the rocky unresponsive soil of this unpredictable world – and has found us in the soil of the world. We are the treasure, which God has found for himself in the midst of the ordinary life of the world – a treasure for which he has invested his most precious possession, his Son, Jesus, in order that we might become God’s permanent treasure and so be treasured by him forever. Of course, a treasure found in a field probably requires careful care and cleaning - not unlike our old baptismal font, which required careful cleaning and restoration after we found it in the cemetery. And so do we! But a God who is willing to get involved in our world from the inside – by becoming one of us and living our life in our world – is not going to shrink from the added work of nurturing and perfecting his treasure in his people. Whether we picture him as farmer or merchant or fisherman, God has always been busily involved in our messy, mixed-up, unpredictable world. The work God has begun by finding us for himself, that same work continues in our daily life as his people, his Church, where the messy, mixed-up, and un predictable is gradually being cared for , cleaned up, and transformed – or, to use St. Paul’s words from today’s 2nd reading, called, justified, and glorified. Whether we think of ourselves as having been dug up from under a pile of rocks or fished out of the sea, as God’s people in whom God has invested so much – invested himself, in fact – we are now in the lifelong process of being transformed into God’s treasure - called, justified, and glorified. The more we give in to what God is doing with us, the more we will identify ourselves fully with what God is doing in our world and so become co-workers ourselves in the mission of farming – or fishing – the world for God’s kingdom of heaven. Homily for the 17th Sunday in Ordinary Time, Immaculate Conception Church, Knoxville, TN, July 24, 2011. It was not quite “10 Days That Shook the World,” but it was a great 10 days, vacationing in New York (plus a couple of days tacked on at either end in Washington, DC). Perhaps not unlike some other unmarried people my age, I don’t really have a “home” to go back to. Certainly I don’t have anyone anymore in my old neighborhood in the Bronx, and this fall it will be seven years snow since my mother moved to California to be near my sister and her family. So the “home” I come back to (and eagerly embrace as such), when I visit my “hometown” of New York, is inevitably the Paulist Motherhouse on West 59th Street. Certainly it qualifies as a legitimate claimant to “home,” since I did after all live 13 of the past 20 years of my life there. As those opportunities have diminished somewhat, I have come to look forward to vacation as a time to reconnect with a few old friends, do a few things I don’t get to do much anymore (like walking around the city), and just relax with only the most minimal demands on my schedule. I’m guessing that was how earlier generations of Paulists saw their summer sojourns at Lake George, and as I age I think I am coming to appreciate that experience more and more. I am not a hot-weather person. (Woe is me, in this era of Global Warming!) It’s fair to say I’d prefer the summer vacation period to be maybe half as long as it now is. That said, there is also, I recognize, certainly something to be said for the slower, less demanding pace summer allows. ( historic adaptation to summer heat before air-conditioning). I first came to appreciate this in the 1970s in graduate school. Not only was the campus emptier and quieter in summer – with mainly us grad students and hardly anyone else around, it was also a time when we grad students were more relaxed – working in the library much of the day, but free to socialize more with one another. Graduate school at Princeton in the 1970s was surprisingly something of as community – and was most so in the summers. So a cheer for vacation – however one spends it – and at least half a cheer for the summer season that makes it possible! I woke up this morning to TV’s morning news coverage of “Question Time” in the United Kingdom’s House of Commons. As theater, of course, “Questions for the Prime Minister” can be quite entertaining. (And I admit to having watched it often myself in years past. And, back when I was in Toronto, I occasionally a visitor to watch “Question Time” in the Ontario House – tamer, to be sure, than Westminster, but still somewhat entertaining as live theater.). Holding elected officials accountable is surely something to be valued in any free society. To the extent that – in a system based on “Parliamentary Supremacy” - “Question Time” contributes to a culture of accountability, it is, I suppose, a good thing. Still, I suspect, it is watched as much for its entertainment value as for anything else. Surely, that must account for its prominence on the morning news today. Once again the news media got to do what it so loves to do – focus on scandal, and not just focus on scandal but focus unremittingly and utterly unrestrainedly on scandal. Certainly, something so prosaic as the debate about raising the debt-limit in the U.S. can hardly hope to compete with the entertainment generated when prominent people are caught in problematic situations! Let it be stipulated that the offenses allegedly committed by certain British “Red Top” Tabloids are reprehensible. That said, their behavior has long been reprehensible. And it was only marginally less reprehensible when the victims were royal princes, politicians’ children, or other public persons/ More to the point, a narrow focus on the particular offenses allegedly committed by those “Red Top” Tabloids may let the rest of the media – the so-called “mainstream” media, which prides itself on its ”journalistic” ethos – off the hook. Does anyone seriously doubt that the debasement of our political culture in recent decades has been exacerbated by the priorities of the media? Nor should the “class war” dimensions of this scandal be ignored. Traditionally, Tabloids have entertained the “lower” classes. Higher status people typically read higher-brow “mainstream” media, whose journalistic “standards” were relatively coherent with the values and conventions of their class. There may be much to be said for those values and conventions. Not being a post-modern person, I feel free even to propose they might be morally better. Not that long ago, even those who enjoyed scandal-centered tabloid journalism might have agreed. The widespread revulsion to the extreme behavior allegedly perpetrated in this case seems to cut across class lines – suggesting that many still would agree. That said, the class component of some of the outrage remains evident. Murdoch himself is a successful entrepreneur who has achieved wealth and influence far beyond his class origins. From a more traditional upper class perspective, perhaps there may be some satisfaction is seeing him brought down a notch, while at the other end of the spectrum there may be the customary satisfaction of the less well-off at a rich man’s fall from grace. If, as a result of what is now happening in Britain, news media became more restrained and focused more on helping citizens understand the really important issues confronting our society, then something good would come of this. There is, however, a reason why I phrased that last sentence in the subjunctive and conditional moods. On my last day in New York today, I made a nostalgic final visit to the Borders Bookstore in the Time-Warner Building at Columbus Circle. I never got a chance to do that at the big Barnes & Noble on Broadway and West 66th Street that closed back in January. At least Barnes & Noble is still in business. The store on Broadway and West 82nd Street that I used to frequent in the 1990s (before the 66th Street store was opened) is still open - for now at least. 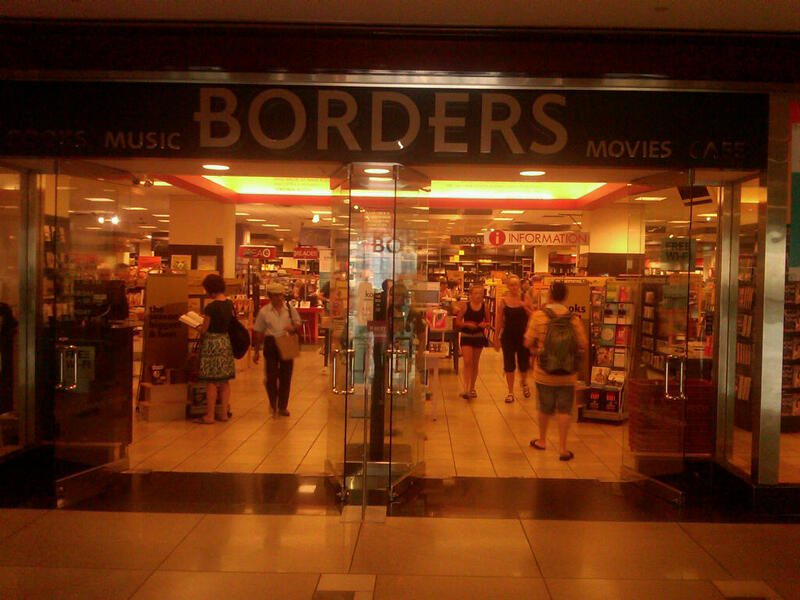 But Borders is closing all its stores nationwide - all 399 of them. 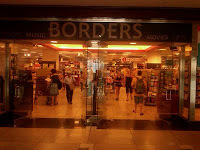 Apparently, the Borders company was not able to find a buyer for the bankrupt business. And so it's over. There is certainly a lot to be said for bookstores in general and to lament the terrible loss their seemingly inexorable demise portends - not just for reading, but for the larger life of the communities their presence particularly nourished. Like the smaller, independent bookstores of my younger years (that the chain stores undoubtedly helped put out of business), bookstores are a true treasure for a local community; and they certainly were a personal oasis for me over the years. I've long loved browsing in bookstores' stacks, which the larger chain stores especially facilitated by providing places to sit and buy coffee, etc. They also hosted community events and the kinds of book presentations I often watch on CSPAN on weekends. I suppose some will hail all this in the name of progress. And, in the larger scheme of things, of all the social and communal resources modern life has progressively deprived us of, this is hardly the most tragic component of the world we have lost. Even so, every loss is a loss, and human life and human community are immeasurably impoverished by the accumulation of such losses. For now, I mourn the fact that the next time I visit my old home here in midtown Manhattan, not only Barnes & Noble but Borders too will be gone, inevitably to be replaced by something far less enriching for me and for those who live, work, or visit the upper West Side. Maybe, if I were more of a “rational actor” homo economicus, perhaps I might have waited to get home in Knoxville to see Harry Potter and the Deathly Hallows 2 - rather than seeing it at New York City prices here in Manhattan this past weekend. But I am not – and so I didn’t. And I’m glad (about both). I am, however, enough of a “rational actor” to delay gratification – at least modestly. Left to myself, I’d probably have gone to the morning show on Friday. Two NY friends, however, suggested I got with them on Saturday night. It’s always more fun to go to a movie with someone else rather than alone, and it’s certainly more fun to stand on line with someone else rather than alone! (Even though the tickets are bought in advance, one wants to be in a good spot on the line to get a decent seat and not end up sitting separately or in the front row). I have read all 7 Harry Potter books (published almost every year from 1997 to 2007) and now seen all 8 Harry Potter movies (issued in turn over the course of the decade 2001-2011). I fell in love with the first book and have been a fan ever since. In an era when reading is in decline, good literature (i.e., well composed stories, written in really good English) is itself a true treasure. Being a bit of an Anglophile, I suppose I liked the portrayal (especially in the earlier books) of what was in effect (however magical) something like a British Public School - with the accompanying message that, however much such a school may be a fun place to study and a good place to make life-long contacts, it might also be a dangerous place (as well as a haven for bullies). Having grown up with fairy-tales, I was no doubt attracted to a new fairy tale, with lots of classic fairy-tale characteristics, set in our own time. That, to me, answers the uniquely contemporary, nanny-ish objection that the Harry Potter stories are frightening (as if the fairy-tales I grew up with weren’t) and also the fundamentalist Christian objection that the Harry Potter stories are neo-pagan (as if classic fairy-tales about witches, fairies, etc., were all somehow Christian in origin). Most of all, however, the Harry Potter stories highlight some of the most socially significant human virtues – qualities like personal integrity, friendship, and loyalty, virtues practiced conspicuously by Harry himself, but also by his cadre of good, close friends. In fact, it is one of the most enduringly appealing features of the series (right from the beginning) that great deeds get done, not just by Harry (of whom great deeds were always expected) but by Harry’s friends (notably Ron Weasley), apparently ordinary folks from whom great deeds were not necessarily expected. In the earlier books (and their corresponding movies), Harry, Ron, Hermione, and their classmates are still kids. There is indeed danger, and Harry (helped by Ron and others) responds heroically. Even so, however, the overall tone is truly magical (in the joyful as well as literal sense). As the kids grow and pass puberty, the typical crises of adolescence appear in all their typically teen-age apocalyptic intensity – perfectly paralleled in turn by the increasing intensity of an increasingly apocalyptic threat to the magical wizarding world, highlighted in a series of intensely tragic deaths of a fellow student, of Harry’s godfather and friend, and finally Harry’s mentor and main protector, Dumbledore. At length, in the final book (and the last two movies), what should have been Harry’s “senior” year at Hogwarts has Harry hiding and on the run, far from the fun of school – only to return there for the climactic battle at the end. The final book’s division into two movies was presumably necessitated by the enormous length and complexity of the last book. One incidental advantage of that division has been to highlight the final playing-put of Harry, Ron, and Hermione’s relational adolescent angst in the earlier movie, leaving the last one to focus almost entirely on the apocalyptic conflict and the final battle scene. Especially in the final scenes, it is hard not to notice quasi-Christian symbolism. Harry voluntarily goes to die – offering his life in sacrifice to save the many. He returns to life again, however, resulting in the ultimate victory over evil. In the background, both facilitating Harry’s sacrifice of himself and his return to life, Dumbledore can be seen as a kind of God-the-Father figure. While it would seem strange to suggest that such imagery is accidental or inadvertent, it is not necessary to interpret the Harry Potter series primarily as a Christian parable. After all, such Christian symbolism is deeply rooted in Western culture and literary tradition. In the Harry Potter series (as in fairy-tales in general), good ultimately triumphs over evil. The magic makes it exciting (and produces plenty of exciting special effects), but it is the ordinary, human virtues, traditionally celebrated in Western morality (Christian and pre-Christian) that are exemplified by the heroes and make the ultimate victory possible. This summer, we have been making our way, week-by-week, through Saint Paul’s great letter to the Romans, which Saint Paul wrote around the year 58 or so of the 1st century A.D. It’s the longest and most studied of all Saint Paul’s letters. My first extended personal encounter with today's passage [Romans 8:26-27], however, occurred, long before I had ever studied or even read Romans. It was almost 40 years ago in a Peanuts cartoon. Charlie Brown was moaning and groaning about something or other, until finally someone said to him, “Stop sighing,” to which he responded, “It’s scriptural,” and then proceeded to cite Saint Paul’s words from the short passage we just heard today – in the more elegant, more traditional translation, for the Spirit helps us in our weakness, with sighs too deep for words. Well, of course, there really is a lot to sigh about. Just tune into to CNN and follow the debate - or what passes for a "debate" - on the debt-limit. Indeed, the background for the 2 verses we just heard could be called “the problem of the present,” that is, the tension between, on the one hand, the obvious reality of the present time, the sense of overwhelming futility that seems to characterize the world, and, on the other, our hope as children of God and joint heirs with Christ. We have, Saint Paul insists, been offered an alternative, already in the present - the revelation of the children of God, empowering us to receive the word of the kingdom and so bear fruit (what Saint Paul calls the first fruits of the Spirit) by responding to its stirring call to a total reorientation of our lives. Even so, we remain burdened by what we have made of ourselves and our world. Left on our own, we would stay stuck there. Prayer is our entrée to a different future – a future better and brighter than the present but already accessible to us now, thanks only to the presence and power of the Holy Spirit acting upon us, filling us, surrounding us, transforming us. Similarly, the parables Jesus proposes in today’s Gospel [Matthew 13:24-43] all illustrate the slow – but inexorable – establishment of God’s kingdom, transforming our pathetic present into God’s glorious future. God sows his good seed in the field of the world and patiently waits until the harvest before separating the wheat from the weeds. The weeds are very real and must be dealt with eventually. But God’s judgment is patient with the world – for our sake. Because, of course, God is not at all like us! As we just heard in the book of Wisdom [12:16-19], God’s mastery over all things makes him lenient to all. He governs us with much lenience, thus giving us good ground for hope that he would permit our repentance. God is not at all like us! In our frustratingly futile present, we lack patience – with God, with ourselves, with our world. But, again, God is not like us! Like the yeast which, when mixed with flour, leavens the whole batch, God is patiently filling, surrounding, and transforming our world with the presence and power of his Holy Spirit. As the first fruits of the Spirit, we – the Church, Christ’s witnesses in the world – reflect the Holy Spirit’s leavening presence and power at work. We are not quite there yet, of course, as the parable of the field so dramatically demonstrates. Wheat and weeds coexist in the Church – as they do in each one of us individually. With the presence and power of the Holy Spirit acting upon us and within us, we are being aided to trust God’s process and make good use of the opportunity his patience provides us. Homily for the 16th Sunday in Ordinary Time, St. Paul the Apostle Church, NYC, July 17, 2011. The news media are having a field day, counting down the days to August 2 (or thereabouts) when the U.S. Government will no longer be able to pay all its bills. We have all gotten so used to this adolescent style of governance in which everyone postures until the last possible minute before striking whatever deal can be made. After all, how many contract negotiations have gone down to the wire? How many bills have been passed in the waning hours of a congressional or legislative session? In most of those other cases, however, regardless of how immature the process and absurd the dithering, there was usually a reasonable expectation of eventual resolution - because it could be assumed that the parties involved wanted a resolution. That's less clear in this current case. For years, the debt-limit has been routinely raised, because everyone understood it had to be. (That didn't prevent individual posturing politicians, confident that the problem would be in any case solved by the grownups who were voting, from casting their own vote against an increase - as Senator Barack Obama once did). But this is different this time. There just don't seem to be enough grownups around anymore to do what needs to be done. The bottom line, of course, is that we (the United States) have been eating some very expensive meals for years now, and (as regularly happens) the bill needs to be paid. This is not about increasing entitlements or other discretionary spending. It's about paying the bills we've already committed ourselves to. A case can be made, of course, for going on a bit of a diet, but that is another matter. Which brings us to the heart of the problem. While there is plenty of blame to go around and both parties have earned their fair share of it, the pressing immediate problem has to do with one party's peculiar attitude toward government, and that party's apparent desire to use this crisis further to reduce the role of government. Hence the obsessive preoccupation with not raising taxes. The issue for them is not how to pay for the things people apparently want and expect their government to provide, but finding a way to stop providing for them (using the excuse that we can't afford them anymore). No doubt, something will be done to prevent a catastrophe or at least minimize its effects. But it's not likely to be the grand bargain compromise an earlier era would have come up with, back when governing was still at least important as posturing and electioneering. This morning, I took the A Train 10 190th Street and, after a leisurely walk through Fort Tryon park, spent most of the day at The Cloisters. Since 1938, The Cloisters Museum, thanks to the civic-spirited generosity of the Rockefeller Family, has been a neo-medieval oasis at the Northern end of Manhattan - its heaven-focused stone structures subtly suggesting that modernity's concrete canyons of secularist materialism need not be humanity's exclusive option. 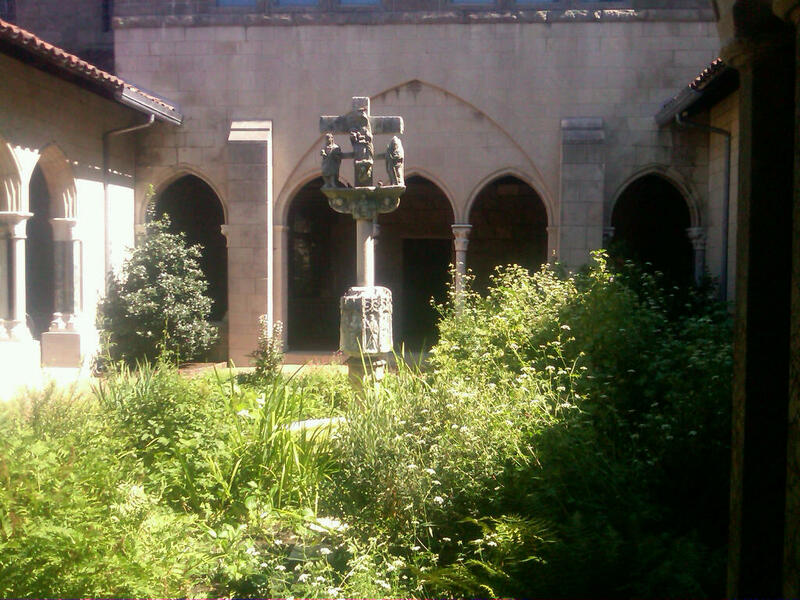 Like any museum, The Cloisters is, of course a collection of things - most of them "religious," to be sure, but some (furniture, for example, and the gardens of medieval plants) which a contemporary could legitimately classify as "secular." Since this is a medieval museum, as well as a branch of the Metropolitan Art Museum, it is largely a collection of beautiful, old things (as opposed, say, to a modern art museum's typical collection of ugly things). But, beyond being beautiful, the objets are also largely purposeful. Like most pre-modern art, the objects in The Cloisters were mostly created to serve some social purpose. In most cases, of course, that purpose was directly or indirectly connected with worship (the pre-eminent social activity of that period), Even the more "secular" objects, however, were typically intended to serve some social purpose - even if, to our way of looking at things, their purpose may have been primarily more "ornamental" than "functional." To me, it has always seemed strikingly characteristic of our own modern era that so much of our "art" is created with no purpose beyond itself - no purpose other than to be exhibited - perhaps because it serves more as an expression of the artist in isolation than of the values and priorities of the artist's society. 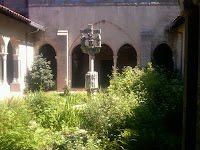 Anyway, The Cloisters is also, as I said, an oasis. (In fact, I myself first became a member of the Metropolitan Museum of Art back in 1987 in part because I lived and worked near The Cloisters and liked going there on occasion for an hour's "break." Only in the most superficial sense, of course, can The Cloisters be said to transport one to a different time and place. What it does do, however, is create a space within which one can absorb some of the harmony and tranquility, which the buildings and the objects enshrined within them recall and signify. These are not, needless to say, exclusively medieval qualities. (In any case, the real Middle Ages were not so terribly tranquil and harmonious as the values expressed in its art!) But they are qualities, whose value that era recognized (and celebrated) more effectively than we today are able to do. No doubt that is why so many churches were, until recently, constructed in a faux-medieval style - recognition of that art and architecture's ability to evoke certain spiritual values. (Sadly, contemporary cultural prejudices having diminished those values even in religion together with the problem of cost have conspired to produce so many modern churches which seem to be inspired more by the art and architecture of the shopping mall and the big box store, but that, of course, is another issue). The 150th anniversary of the Civil War has, not surprisingly, seen a veritable avalanche of books about that monumental conflict that cost us so much and was in so many respects the decisive episode in our national history – its importance heightened by the fact that we are still sorting our its legacy. I’d like to read all the new Civil War books; but, of course, I have neither the time nor the energy to read everything about what is undoubtedly the most written about event in American history. In anticipation of my vacation, however, I bought myself a copy of the one of the latest bunch of Civil War books, one which I anticipated I would personally find particularly interesting - Southern History Professor George C. Rable’s lengthy God’s Almost Chosen Peoples: A Religious History of the American Civil War. Rable tells the religious history of the War on several levels – theologically, institutionally, and personally. Theologically, the war was widely interpreted in terms of what Rable rightly calls Americans’ shared “providential outlook on life.” Most famously, Abraham Lincoln eventually came to see the sufferings of that terrible war in relation to God’s purposes and in the light of God’s judgment on Americans – both Northern and Southern – for the sin of slavery. Of course, not everyone saw slavery as a sin. Especially in the run up to the war, abolitionism was often seen as anti-biblical, even atheistic. The way preachers and other religious figures (including such Roman Catholics as Browson, McMaster, and Archbishop John Hughes) wrestled with the moral questions connected with slavery and secession is presented in great detail, along with the institutional impact of the conflict upon the churches, forced to face questions about their polity and their relationship with the political state (either the United States or the Confederate States), as well as more traditional moral questions, all of which came to the fore both during and before the war. Rable is especially good on the whole “civil religion” dynamic, as it evolved under the pressure of events and in the context of both old and new, established and challenged loyalties. Then, there was the personal dimension, as many Americans struggled with the meaning and value of religious faith and observance under such novel circumstances. Rable is especially good on what it was actually like to be a soldier in a military camp – or a chaplain or preacher ministering to soldiers in such settings. And, although America was an overwhelmingly Protestant country at the time, he does not neglect the way the war was experienced religiously by Catholics and Jews, both North and South. The significant contribution of Roman Catholic nursing Sisters gets its due, as do the unique challenges experienced by the minority religions as problematic participants in Northern or Southern Civil Religion. The American religious landscape has changed a lot in 150 years, of course. We are on the whole less open to, if not seriously suspicious of, theodicies that attempt to explain anything (let alone everything) in terms of God’s providence or judgment. Yet we are still an overwhelmingly religious nation- even if, what that actually means is open to question (just as it was back then). As long as religion remains so central to so many Americans’ world-view and as long as the unresolved issues of the Civil War continue to haunt our politics even today, the Civil War as a religious experience retains its immediate relevance – not just for who we were as a nation 150 years ago but for who we are now. A sower went out to sow. How many times have we heard this parable? When I was studying the Gospels in the seminary, one of my professors was fond of citing that familiar opening line as an example of how we have become so accustomed to hearing certain parables that, when we hear a familiar line like that, we already know what follows and how it is going to end, and so our tendency is to start to tune out – which, of course, is one of the very things the parable is warning us not to do! To us here in midtown Manhattan, where there hasn’t been a functioning farm now in a century or more, parables about famers sowing seed sound exotic – and, in this particular case, somewhat strange. What, we efficient modern city-dwellers, want to ask, is the farmer doing? Why does he sow his seed in such a helter-skelter way? Perhaps it may have seemed somewhat inefficient even to the Greek and Roman urban audiences for whom the Gospels were first written. Of course, Jesus’ actual hearers – the original audience for this parable - would have understood. Israel’s arid climate and rocky soil are not very farmer-friendly. Finding in advance the pockets of good fertile soil, with the limited technology available to traditional agriculture, would have been very difficult - and inefficient. Throwing the seed all over the place may mean a lot will be wasted, but it probably guarantees that some will fall on good soil and take root and produce fruit. So what may seem like inefficiency to us turns out to be really quite efficient indeed! Jesus uses this familiar fact to say something about how God produces fruit in the world, reaching out to us with extravagant generosity, recognizing that maybe not everyone will respond – or, having responded, really persevere. Even so, he reveals himself as widely as possible, in many and various ways. He does that because that is who God is and how God acts - and how he expects his Church to act in imitation of him. Above all, God’s extravagant generosity invites such an extravagantly faithful response on our part – producing fruit as much as a hundred-fold. Homily for the 15th Sunday in Ordinary Time, Church of Saint Paul the Apostle, NYC, July 10, 2011. Visiting at St. Paul's College, the Paulist Formation House in Washington, DC, one can not miss the big change that has taken place on the property, as acres of grass (including what was once a ballfield - still called that in my time, although of course no one ever played on it anymore) have given way to fancy new townhouses, that seem to be enveloping the monumental seminary building, as it were embracing the palatial structure. The buildings are going up quite quickly. (Perhaps, that is a side benefit of an economy in which there must be lots of contractors eager for work!) I took a walk through the new development this afternoon, and visited the company office, where two model homes are open for inspection. Even though I wasn't there to consider buying a place, I was nicely welcomed and shown around. Of course, I know nothing about building construction and can't evaluate the structures per se. Esthetically, however, the homes are very attractive and seem as though they would be nice to live in. A good number of units have been bought already, and some seem already occupied. Remembering what it used to be like, I complimented the company representative on creating such a potentially nice residential neighborhood and opined that the one thing still lacking for it to become a real neighborhood was stores. He then explained to me that just about a block or so away, where a former CUA dorm once stood, there will be construction of commercial space - i.e., stores. Presumably all this will make our property safer and more attractive (and probably worth more). In the end it should all be good for the Paulists and the other adjoining institutions, good for the University, and good for Brookland. Living there as a seminarian almost thirty years ago, our lives seemed one the whole quite disconnected from the immediate environment. we lived there and went to school there, but practically everything else - shopping, a movie, dinner out - involved driving somewhere else. We were, of course, a bigger group than today's classes and so had much more of a community experience within our own walls. Still, it might have been nicer to have had more on-the-ground connectedness with our environment. Neighborhoods are good things. They are par tof what makes urban living work - and work well. Si it's good to see Brookland becoming a neighborhood once again. Generally speaking, my favorite way to travel is by train. That's just fine if you live in the so-called Northeast Corridor, where, in addition to the commuter rail lines, there are the major Amtrak lines connecting New York with Boston to the north and Washington, DC, to the south. Of course, I don't live there right now. And the city where I now live, Knoxville, lost its train service some time ago. (There are still freight trains passing through. I can hear them every night. But no passenger trains). Unless one wants to drive everywhere, long-distance travel means air travel. Air travel is super expensive, however, and has many other inconveniences - e.g., my 30-hour trip last month from San Francisco to Knoxville, much of it spent stranded at Dulles Airport outside Washington. At least Washington and NY have direct flights to and from Knoxville, although the other inconveniences - high cost and the persistent problem of stormy weather - remain. So, rather than fly to NY for my summer vacation this year, I decided to experiment with Megabus. Megabus has been around awhile, providing service to and from various cities and recently instituted a run between Knoxville and DC. The thing about Megabus is that, if you purchase your ticket far enough in advance, you can ride for $1. So, yesterday, I took the Megabus to Washington. It's about a 9-hour trip, which is a bit on the long side, to be sure. By definition, the bus lacks some of the amenities of train travel. But, for $1., who's going to complain. Actually, the service was good. The bus left Knoxville on time and was only about half-full. It made one rest/lunch stop and then stopped again somewhere in rural Virginia to pick up more passengers. So, for the last few hours, the bus was almost full. That's good. It means they will stay in business! We arrived in Washington just slightly behind schedule, thanks to some rather heavy traffic entering the city. But otherwise, it was a fine ride. I doubt I would always choose the bus over the plane to go to Washington, but it's a handy option to have - especially if one's plans are tentative. If it costs (literally) just a couple of dollars, I may not hesitate to buy a ticket even if i am still unsure about whether I will actually be able make the trip, whereas with airfare that would be much more problematic. Of course, if air travel were cheaper and more user-friendly, that would be great. Having a passenger train connection would also be great. But, for the time being, the bus is a worthy alternative. So, I am here at the Paulist seminary in DC, just hanging out for a couple of days, before heading up north to New York (by train) for some serious vacation. Yesterday saw the death of Archduke Otto von Hapsburg (November 12, 1912 – July 4, 2011), who by right ought to have been Austrian Emperor and King of Hungary. Those were the roles he was born for, as the eldest son of the Archduke Karl (who reigned as Austrian Emperor and King of Hungary from the death of Franz Josef I in November 1916 to the collapse of the multi-national Empire in the political and cultural shipwreck of Central Europe that was the result of World War I). Otto’s father, Kaiser Karl I, died tragically in exile in 1922, but in 2004 was beatified by Pope John Paul II and is now venerated as Blessed Karl I – his feast day October 21, the anniversary of his happy and loving marriage to Princess Zita of Bourbon-Parma in 1911. Related by royal blood to virtually every Catholic royal family, he was the heir of the pre-eminent Catholic family of Europe, the dynasty that remains a living link to the whole heritage of Christendom that had been embodied for almost 1000 years in the Holy Roman Empire (the 1st German Reich). Otto himself, in his almost a century of life, linked our anxiety-ridden 21st century with an earlier, pre-world War I world, his life-span largely corresponding to the tragic wars and destructive ideological movements which dominated that intervening century and turned the ancestral lands of the Hapsburg Empire into bloody killing fields, and centers for political tyranny, destructive social engineering, and monumental economic mismanagement. The first half of Oto's life was defined dynastically by the tragic outcome of World War I, a series of unsuccessful efforts at restoration, and growing up in exile in Spain and Belgium (where he studied at Louvain) and, during World War II, in the U.S. Prior to the War he had unsuccessfully sought to fulfill his dynasty's historic mandate by trying to prevent the 1938 Anschluss. In the post-World War II era, Otto worked to fulfill his dynasty’s historic mandate as a Christian-Democrat member of the European Parliament, a role in which he distinguished himself. When I first visited Vienna in 1970, as a college student studying German over the summer, Austria was still recovering from World War II and still trapped in the vise created by the Cold War’s division of Europe. It seemed to this tourist that Vienna’s history had sort of stopped on November 11, 1918. Not much that had happened in that part of Europe since then had been very nice. Much of it had been pretty awful. Nostalgia for a glorious, imperial past, now virtually out of reach, made a certain sort of sense. So I visited the Stefansdom and the Hofburg. I saw the Holy Roman Crown and regalia. I visited the crypt in the Kapuzinerkirche where the Hapsburgs lie buried (and where, presumably, Otto himself may be interred, as was his mother, Empress Zita in 1989). More than three decades later, after attending a concert in Prague, I asked our guide if the shabby ampitheater we’d been in had been built in the Communist era. She replied, “Of course. No self-respecting Hapsburg would have built anything so ugly!” Nostalgia aside, that comment powerfully summarizes both the Hapsburg legacy and the tragic mess that replaced it. July 4 is supposed to be a happy holiday. Even during the Civil War, when the future of what had begun back in 1776 seemed more up for grabs than ever before or since, both sides celebrated July 4. And we still do today (even if some of our presidential candidates can't seem to get the story of the Founders right). Yet, for many Americans, there seems precious little to be celebratory about this Fourth of July. According to a new TIME/Aspen Ideas Festival Poll, the U.S. in this post-9/11 decade is in a long period – one of the longest ever – of unhappiness and pessimism. What seems newsworthy about that is how out of character that is with the predominant tradition of optimism that has characterized American and its people. Thus, some 71% of Americans see us as worse off than we were a decade ago. Even more pointedly, there is the widespread perception that some have borne the brunt of American decline more than others. In view of the increasing inequality in American society, such a perception is simply stating the obvious. The same July 11 edition of Time that published those poll results also contained the sadly unsurprising news that, while still slow to spend capital to create much needed jobs, many corporations continue to spend big-time on private jet travel to top resort destinations. Seniors, for all their angst about any attempt to introduce the least amount of rationality into entitlements, probably have the least to worry about. As my Baby-Boomer generation prepares to climb aboard the Social Security & Medicare gravy train, however, just how long that ride will last and how far that train will be able to travel have become an increasing source of anxiety. Add to that my generation’s justified fears for their children and grandchildren’s future prospects! Of course, it could always be worse. We could be like those societies where young men (educated or not) are increasingly likely to be unemployed – and in some societies decreasingly likely to be able to find wives. Somewhere between such extremes and our American malaise there is the ominous state of Europe – where what we have been watching happen in Greece is likely not the end of the story. So there is a lot to be anxious about this 235th anniversary of that Glorious Fourth. The present state of our politics – and the prospects for worse as we head into another election – offer little grounds for optimism. Somehow, however, after the fireworks have finished and the hot dogs have been digested, we will all need as a society to get serious again about making the promise of July 4 really happen – for ourselves and for the generations after us. No More "Week in Review"